While spilling can be a pretty nasty thing on your kitchen worktop or stove top, it is a totally different thing when it comes to ‘spilling’ a flower display in your garden! And is there a better centerpiece than a spilled flower pot? I guess not because this ‘garden landmark adds character to a garden landscape’ with its flowery cascade-like look. 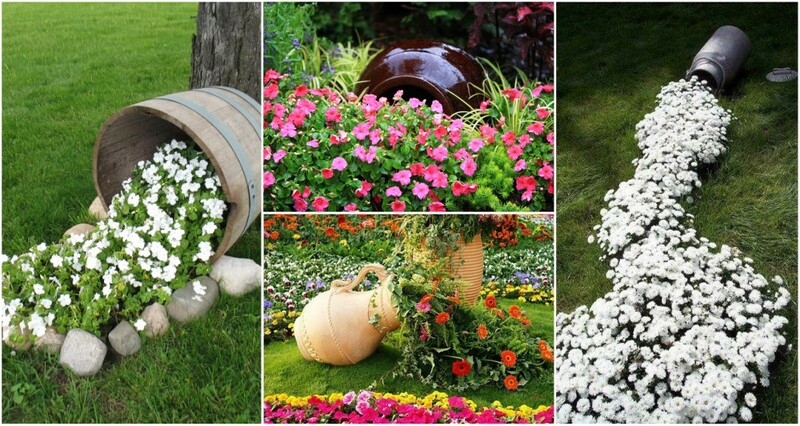 So, to make a spilled flower pot you will first need to pick the best spot in your garden. Once you’ve made up your mind on the site for your spilled flower pot, you will need to gather materials for it. In other words, you will need colorful flowers, a pot and some planting soil or compost. The next easy thing to create your spilled flower pot centerpiece is to dig a proportionate hole to your pot size at your preferred location. Next, stuck the flower pot in the hole, and fill it in with potting soil and 3-4 plants of choice. A spilled flower pot is actually a great, second-hand use for an old pot! As for the pot shape, a circular-shaped pot is perfect for a spilled flower pot. Obviously, this idea is a great way to make use of a broken or an old flower pot. If you use a broken pot, make sure the broken part is fully masked by the soil, to make a nice sight. For the ‘waterfall of flowers,’ we recommends using colors evoking warmth of your senses such as yellow, red and orange as they are also attention grabbing colors. As far as specific plant types are wanted, we suggest an assortment of lobelias, geraniums, petunias, alyssum, daisies, and begonias as they are naturally cascading flowers. You can go to your local florist and buy flowers designated for this project, or you can also use up plants left over from other gardening plans. Although using warm colors for the spilled flower pot is a better choice, cool colors [such as blue and purple] work equally well. Succulents can also prove a hit in your garden! We suggest placing a couple of plants inside the rim of the pot, which makes the plants appear to be spilling out of it, as if someone has accidentally kicked the pot! You should not fret about your spilled flower pots at all: just take care for these plants as you would otherwise with any other ‘un-spilled’ annuals by watering them regularly and using a fertilizer occasionally.